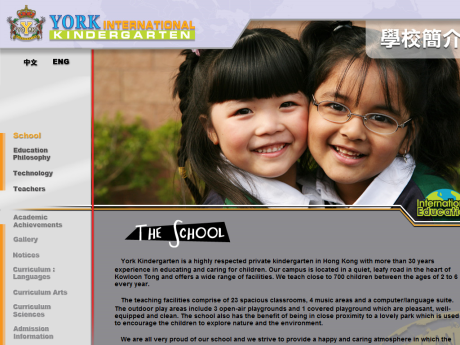 York provides an international education founded in 3 aspects : 1) Proficiency in English, Mandarin and Cantonese2) Alignment with international academic standards3) International exposure and awareness。1) Mastery in languages is a prerequisite of an international education, which is why our children get exposed to a trilingual curriculum as early as 3 years old. However, linguistic proficiency is not sufficient for an international education; the curriculum must also be international as well. 2) To this end, all of our core subjects (English, Science, Math, Chinese, and Music) are benchmarked to international standards, in order to provide each child with an international body of knowlege to allow them the maximum academic flexibility and freedom in the future. 3) Last, in order to develop international awareness, our teachers and children do a lot of videoconferencing and international projects with schools in London, New York, Miami, Las Vegas, Kansas, Ohio, New South Wales, the Gold Coast, Pakistan, and various cities in China. An excellent example of our international collaborations is the “One World Project”, a children’s international charity photo exhibition which we are hosting that seeks to identify the similarities and differences between children around the world. In the project, each child will be given a disposable camera to take pictures of what they want to be when they grow up as well as their likes and dislikes. The pictures will then be collected from all of the participating children around the world to form a photo exhibition which will go on tour around the world to all the countries which took part. © 2018 開學啦！Teacholic All rights reserved.